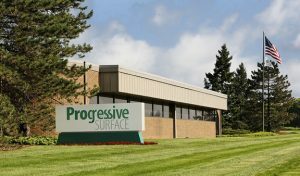 Progressive Surface is one of the best and brightest success stories in the surface treatment equipment industry, but their path hasn’t always been smooth. Learn some surprising facts about the company in the Fall 2017 Shot Peener magazine. The article covers only a few of the 2000 projects Progressive has completed over the past 50 years. These projects shaped the company into a leader in the surface treatment machinery industry. Over the years, Progressive’s philosophy of helping customers solve problems has created numerous opportunities and opened many new technologies and industries. From their early days of building blasting and peening systems, these opportunities have allowed them to also become industry leaders in thermal spray coating and waterjet stripping systems. A true testament to Progressive’s commitment to building the best machine possible is illustrated by the fact that all of the machines reviewed in the article are still in production today—some have over 30 years of service. That’s unheard of in the blasting equipment industry. Progressive has always focused on gaining a thorough understanding of their customers’ requirements, developing the necessary technology to produce process specific solutions, and then providing a lifetime of exceptional support.